يقع فندق Nomads Noosa في منطقة تتمتع بمعالم كثيرة، وتعتبر المكان الأنسب لاكتشاف هذه المدينة رائعة الجمال و ما يحيطها. يقع مركز المدينة على بعد 1 km فقط. ويمكن الوصول إلى المطار خلال 50 دقيقة. يشكل هذا الفندق ملاذاَ مريحاً للاسترخاء ويمنح زواره فرصة للاستجمام والتجدد، وهو يقع على بعد خطوات من المعالم السياحية الكثيرة للمدينة. ببساطة كل الخدمات وأساليب الضيافة التي تشتهر بها Base Backpackers تجعلك تشعر وكأنك في بيتك. لضمان راحة ضيوفه، يقدم الفندق الخدمات التالية: واي فاي في المناطق العامة, صف السيارات, جولات, بار, نادي ليلي . تتضمن كل غرف النزلاء وسائل الراحة والتسلية المصممة خصيصاً لضمان الراحة القصوى للضيوف. يقدم الفندق العديد من الفرص للاستجمام كمثل حمام سباحة خارجي. استمتع بخدمات لا يعلى عليها وعنوان ذو اعتبار في Nomads Noosa . Didn't really do much at the hostel other than just using the bed for a night. Looks like a pretty vibrant hostel with casual drinks in the evenings. I had 3 encounters with a staff member who seemed to be a manager and every time he was rude/sour towards me. I was asking simple questions and he talked down to me as though I was wasting his time or a lesser human being. I'm not sure what that was about... but other than that, it was a fine place to stay. As far as options in Noosa Heads go, this one is nice because it is closer to the bus station and stores. The beach is about a 10-15 min walk, but doable for mostly everyone. Just stay here if you're coming to Noosa. One of the better hostels I have ever stayed at. The rooms are very big, with nice big lockers. None of the best squeaked, and the hostel in general was very nice size. Also very close to a bus stop, so your really not far from anything! I was there just for one night and I don’t thing I would stay longer. 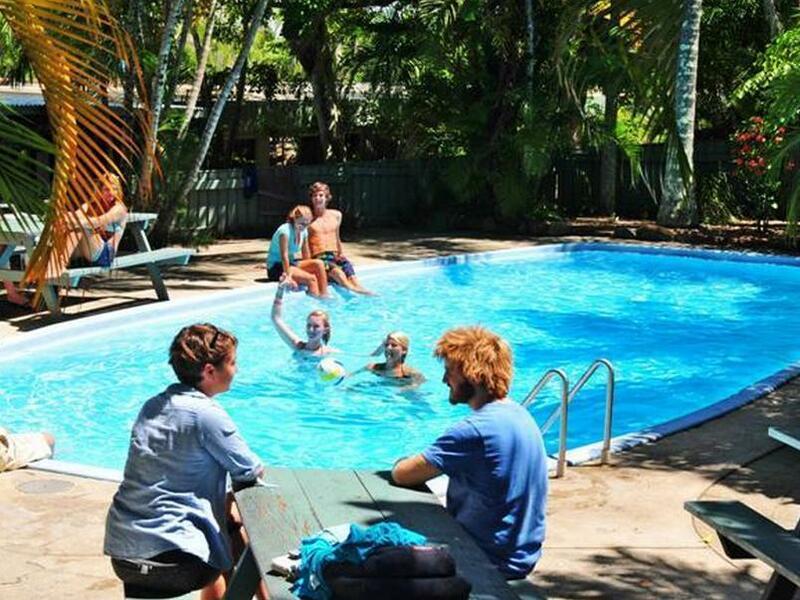 The hostel has a nice garden with swimming pool and tables available for socialise, that part isn’t pretty cool. What I really disliked is that at night there was no respect to the people who we were trying to sleep and some of the others guests were partying in front of the rooms. Difficult or almost impossible to sleep until late. Stayed sun 1/4/18 - tues 3/4/18. Long queue at check in. You have to download the Tipi app and register all your details and then show the barcode on the app upon check in. Make sure to do all this before check in as it will save you soooooo much time. Hostel was great as offer free welcome drink at 7pm, and free bbq upon purchasing a drink (upon paying for a drink you will be given a free bbq token to exchange for food when it’s ready), and also they organised a free quiz where you could win lots of prizes and then dance the night away til the bar closed at 12am. Then they also offer free transportation to a club about a 17 minute walk away. They don’t bring you back so you would either need to walk back or get a taxi. Taxi from the club to the hostel is $10. I would definitely recommend the hostel and stay there again myself. Disgusting kitchen, because they don't know how to manage themselves they move u room every day, the pool need a massive cleaning. And no value for money.. Kitchen is actually discusting. Beyond help. Massive fly infestation around the whole place, which doesn't help when you can only really eat outside and have flys everywhere. Room was stupidly hot.... the amount of electric wasted on 4/5 fans could have air con. And for the price, wow. CHecked in fast, room was ok--one fan was broken. Parking was close by. Fine for a one night stop. I had a nice stay at Nomads Noosa. Room was okay for a backpackers. Can walk to the beach and Hastings Street. The rooms were clean and spacious. Free BBQ was nice. Close to town. It was very quiet here with little atmosphere as out of season. Staff were helpful with information about the area. Showers were hot but the water ran cold after about 5 minutes. Tout est dit, de toutes les auberges australienne où j'ai été celle ci est la pire. Les parties communes sont sales, les dortoirs encore plus, si la lumière marche dans la chambre vous êtes chanceux. La cuisine est sous équipé, petite et sale aussi. Le seul truc qui marche, c'est le bar, et là pour la quiétude on repassera. Musique fort au bar tout les soirs, et musique horrible toute la journée diffusée autour de la piscine. Pour compléter, le wifi gratuit quand il marche n'est à qu'à la réception et il est très lent ! On vous demande 4$ pour 24h pour en avoir un qui fonctionne, comme si la place en dortoir n'était pas assez chère déjà.